Forget about comparing the bonkers new Audi RS Q3 to other cars. You're better off imagining an animated cartoon dragon. You know the sort, plump with tiny wings and looks like it shouldn't be able to fly, but actually goes like a rocket. That's the rorty, snorty Audi RS Q3. It absolutely, positively shouldn't work. But turns out it's brilliant. That's because there's nothing quite like the Audi RS Q3. Sure, there are other compact premium SUVs. There's the BMW will do you an X1. And the new Mercedes GLA. But neither can offer anything to match the performance or sheer automotive audacity of the Audi RS Q3 and its warbling five-cylinder powerhouse of a engine. The Audi RS Q3's basic bodyshell is little changed from the standard Q3's. It's Audi's smallest SUV and ultimately more of a style statement than a really practical off-roader or people carrier. But the engineers at Audi's Ingolstat HQ have taken everything they know about high-performance four-wheel drive motoring and hurled it at the Q3. The result is a unique if slightly preposterous car that straddles at least three market segments. It all starts with the sonorous five-cylinder engine previously seen in the RS3 Sportback and TT RS models. Then there's legendary quattro four-wheel drive system, in this case a pukka wet-clutch permanent solution. Sharing tech across the range is one of Audi's party tricks. That's a good thing because it means the relatively compact Audi RS Q3 packs much the same in-car clobber as bigger, beastlier Audis. That includes Audi's MMI multimedia kit with HDD Navigation Plus upgrades. The only slight snag is the wallet-wilting £1,495 the full high-def system costs. Better value is the Audi Connect internet upgrade option for a mere £350. It adds 3G connectivity and enables a range of internet-connected features. Then again, MMI and Audi Connect are amongst the best fully-integrated systems currently available. Support for features like Google Send-to-Car in the nav system are seriously useful. With Audi Connect, you get Google Earth and Street View, too. By the silly-high standards of other Audi RS models, the Audi RS Q3 is actually a pretty pedestrian performer. By any other metric, it's a bit of a beast. You just don't expect what looks like a hot hatch on stilts to pack over 300hp and launch down the road with a uniquely engaging five-cylinder growl. The seven-speed dual-clutch robo transmission doesn't hurt, either. It delivers that thrust with seamless precision. Monumental 18-inch brakes with eight-piston front callipers, meanwhile, ensure there's control to match all that power. The same goes for the permanent four-wheel drive system. With all that in mind, the CO2 emissions of 206g/km and combined fuel consumption of 32.1mpg isn't actually too shabby. Smallish car, big on interior quality. That's the Audi RS Q3. Nappa leather comes as standard, though you can add a whiff of sister-brand Bentley by ticking the diamond-patterned stitching box. Or give it a race-track vibe with some optional carbon-fibre accoutrements. Space-wise, think Audi A3. It's the car the RS Q3 is ultimately derived from. That makes it a reasonably plausible family workhorse for a couple of adults up front and some smallish children in the rear. What it's not is truly comfortable when brimmed with adults. It can't compete with proper estate cars for luggage space, either. Question. How many buyers are there for a compact, premium high performance SUV? Before we drove the new Audi RS Q3, we'd have guessed zilch. It's the kind of car that fills a niche within a niche and looks slightly ludicrous on paper. But now having driven it, we can't resist the charms of its enthusiastic on-road huff and puff. It's quick. It's characterful. And like all Audis it's packed with tech and beautifully finished. Yup, there are more practical and better packaged alternatives at this price point. 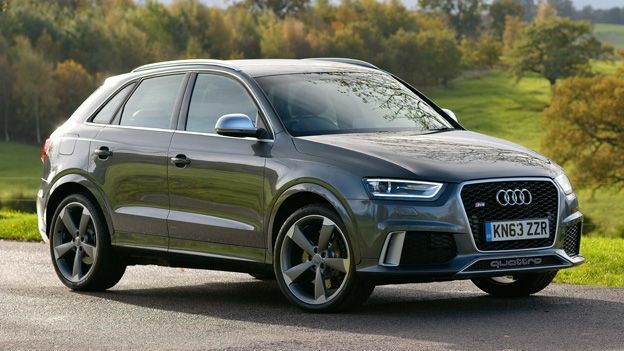 But none combine some of the best attributes of a hot hatch, an SUV and a compact sports saloon like the RS Q3 does. It's a little bit flawed. But it's utterly unique.